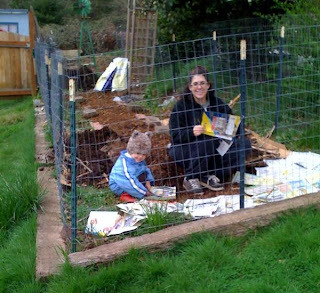 We doubled our vegetable garden space last year, but no amount of rototilling will get rid of the grass and weeds. So we are trying a Lasagna Bed on top to smother the weeds. Griffin had a blast tearing up old phone books to make "a blanket to keep our garden bed warm". Not to mention the benefit of finding a use for my ever increasing piles of phonebooks, empty egg cartons, newspapers and cardboard boxes.